We offer the best in skin therapy. Our skin therapists are thoroughly trained in Dermalogica and SkinCeuticals, two of the industry’s top skin care lines. We will begin your session by conducting a skin analysis to determine the facial best suited for your skin type. The relaxing experience of our one-hour facial includes deep pore cleansing, toning, exfoliating, steaming away and gently extracting impurities, and customizing a mask and moisturizer for you. Treat yourself to an award winning organic skin care line that delivers beautiful results using organic products bursting with juicy pulp, seeds and herbs. Feel good about feeding your skin all natural products without harsh chemicals or parabens. Éminence addresses a variety of skin concerns such as premature aging and wrinkling, sun damage, acne, loss of vitality, tone and radiance. This premier seaweed anti-aging experience will lift years from your face. Specifically targeted towards re-hydration, the final layer warms and causes deep penetration of the active ingredients into your skin for long-lasting, visible results. Excellent before special occasions. Experience this luxurious anti-aging facial that rejuvenates and refreshes, leaving your skin luminous and radiant! Using oxygen, plant-derived stem cells, peptides and concentrated enzymatic botanicals, the O2 Lift delivers immediate and impeccable results! This powerful skin resurfacing system from Dermalogica helps reduce acne, pigmentation and signs of premature aging to reveal smoother, brighter and softer skin. The BioActive Peel is designed to work with the skin’s chemistry, not against it. It safely removes dull outer layers of skin and helps the skin underneath regenerate for a smooth, radiant complexion. Visibly reduces signs of premature aging by improving skin texture. This is a great exfoliant for oily or acne prone skin. 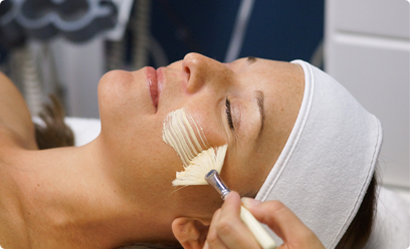 Included with our European facial, use this electrical treatment as follow-up maintenance for combatting breakouts. Temporarily shrinks pores and assists in healing. Introducing the Tria Age-Defying Laser, the only FDA-cleared-at-home laser treatment for your entire face, combined with the synergistic benefits of SkinCeuticals antioxidants. This treatment allows you to experience and get educated on this revolutionary technology. Uses a diamond-tip for deep exfoliation and stimulates your natural collagen & elastin production. Uses “micro-vibrations” for an effective, yet gentle, exfoliation and helps penetrate the active ingredients of our professional products even deeper into your skin for more dramatic results. Originally developed by NASA for healing & tissue regeneration in astronauts, wavelengths of light can be used to stimulate our human cell’s metabolism and repair. We regret that we cannot perform waxing services if you are using Renova, Retin-A, or Accutane.